So this is Recipe 8/10 on my 10 Recipes 10 Weeks blog series. When I originally started this series, it was to continually challenge myself and push myself outside my comfort zone. I had gotten in a bit of a blog rut and I needed something to boost my momentum. What has happened instead is that this series has remained my only connection to my blog. The 10 Weeks symbolizes 10 weeks I have until I graduate and especially the past 4 weeks or so I have been ridiculously busy. Not just like my "to-do list never ends", but like "I'm trying to find a job and figure out what to do with my life" kind of busy. And on top of that I took a second job helping promote an event on campus that I'm passionate about. I was really glad I was able to help them out, but it took up the time I would usually be blogging. I've really missed it. Thankfully, this blog series has kept me posting at least once a week and I'm got great news----I've accepted a job! I'll talk about that more later, but that also means that I have more time to devote to blogging. Now to the recipe----Baklava is something I've always loved, but never made homemade. I found this lovely recipe from The Pioneer Woman and decided to give it a try. It was a great celebratory treat after receiving a job offer! Some tips: 1) Phyllo dough dries out very easily. Only take out 1-2 sheets at a time and leave the rest wrapped up and covered with a wet paper towel. 2) Make your nut layers even and thin for the best result. 3) Make sure to share or you might end up eating the whole thing yourself in 2 days (Didn't happen, but I could see it as a possibility). Preheat oven to 350 degrees. In a bowl or pan, spread out walnuts and sprinkle with cinnamon. Butter a rectangular baking pan. Compare the size to the phyllo dough sheets---you may need to trim them. Melt 6 T in a saucepan. Butter one layer of phyllo dough and place butter side down in the dish. Place another unbuttered piece on top and press down. Repeat two more times so that there are 3 buttered sheets and 3 regular. Butter the top of the last sheet and sprinkle with walnuts so that it creates a thin, even layer. Add two more pieces of phyllo dough (one buttered and one not). Add another layer of walnuts. Repeat another 1-2 times. 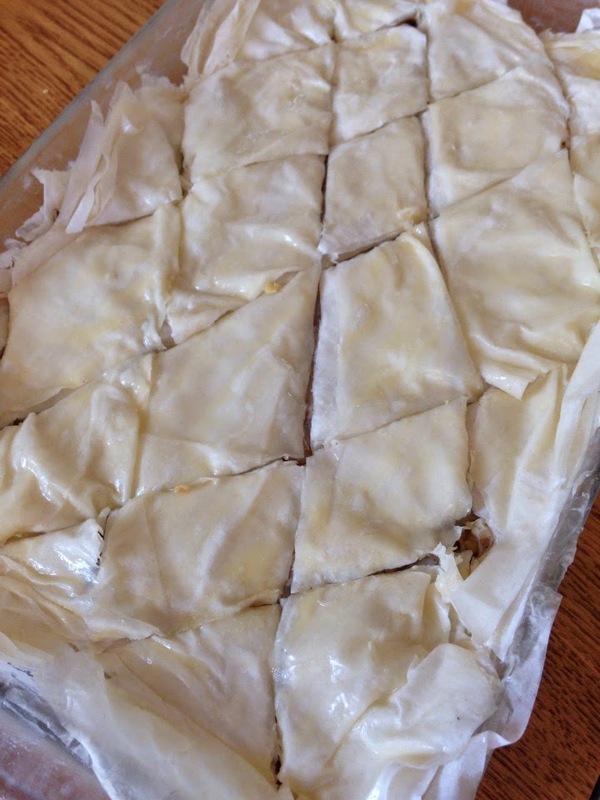 End with 4 more phyllo sheets, 2 buttered, 2 not. Spread more melted butter on the top sheet. Cut a diamond pattern. Start with one long diagonal cut and then go from there. Look at pictures for help. Place in the oven and bake until golden, about 40 minutes. 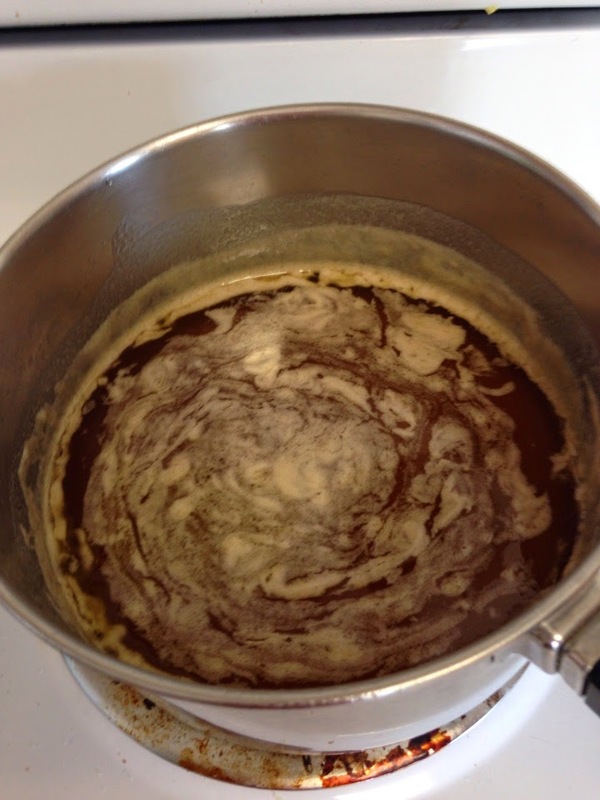 While its baking, combine 4 T butter, honey, water, sugar, and vanilla extract in a saucepan over medium heat. Bring to a boil. Once boiled, simmer for 5-10 minutes until it begins to thicken. Take off heat for the last 10-15 minutes of baking. 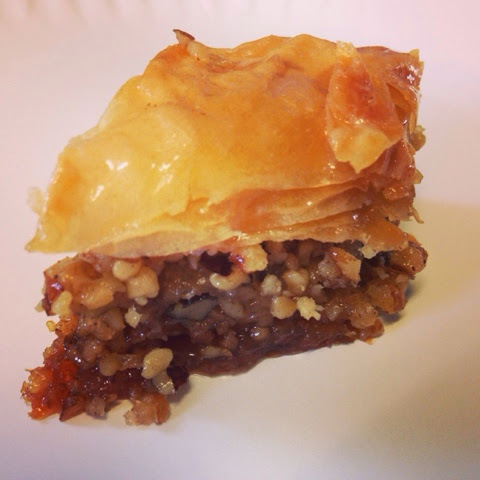 After you remove the baklava from the oven, pour half of the honey mixture over the top. After it is absorbed add some more, but don't drown it. I ended up using about 3/4 of the mixture. Let sit and cool for 2-3 hours and serve. When working with the phyllo dough, you have to work somewhat fast so I didn't get a ton of pictures, but the few I did may help! Check out the Pioneer Woman's post for some more beautiful pictures. 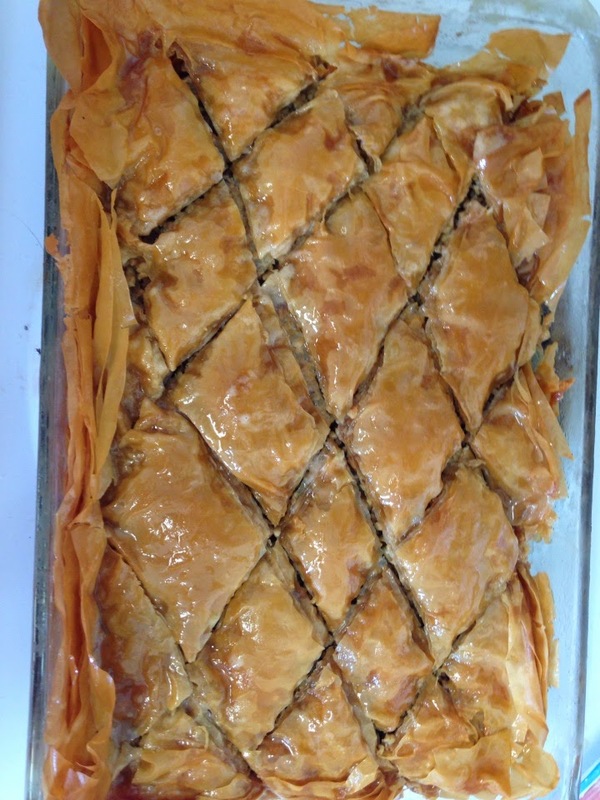 Cutting the diamond pattern on the baklava before baking. This is my final product. The phyllo sheets were too wide. If you check the left side, thats what happens when you don't trim them!